Pneumatics is the Study and application of pressurized gas to produce mechanical motion. Pressure is the force applied per unit area. The force is perpendicular to the area. 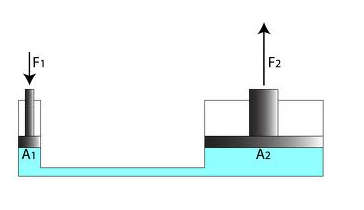 The unit of pressure is Pascal (newton / metre2). 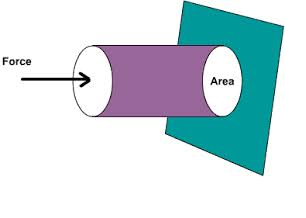 Pascal’s Law: This law states that the pressure exerted at one place in an incompressible fluid, is transmitted in all directions without any change in pressure. This is the main principle used in pneumatics. I.e. to get the air at the same pressure as is released from the compressor. Mechanical motion can produced through so many other things…. then why pneumatics????? 1. Simplicity of design and control— Pneumatics require simple ON/OFF control, circuit design and debugging are easy. 2. Reliability—Pneumatic systems generally have long operating lives and require little maintenance. Because gas is compressible, Equipment is less subject to shock damage. Gas absorbs excessive force. Compressed gas can be stored, so machines still run for a while if electrical power is lost. 3. Safety— since pneumatics uses force of compressed air so any leakage or burst is harmless. 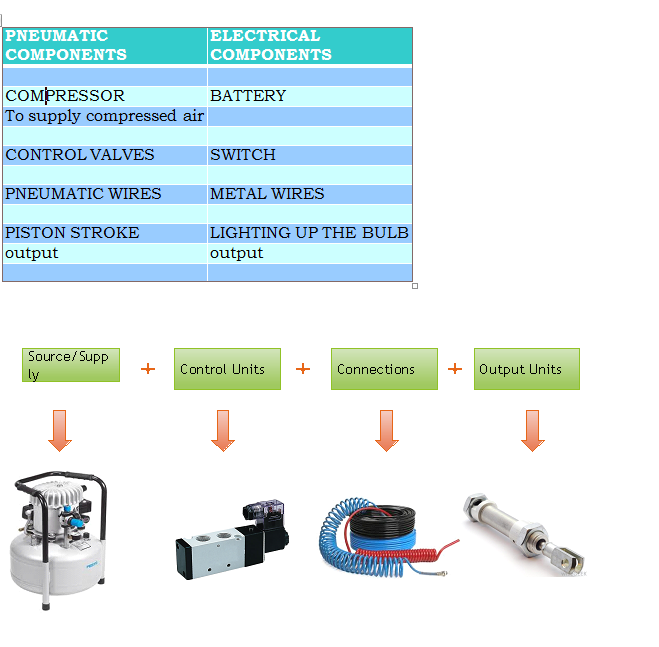 Since now you have a brief idea on what is pneumatics, why it came into picture with robotics. So off coarse you would be interested in knowing what all equipment you require to enter the world of pneumatics, how to use them and what specifications they must have. First I would introduce you to the elementary components required for any pneumatic circuit. To make it a little easier for you let me take the pneumatic circuit and its components analogous to the electrical circuit which most of you would be familiar. It supplies compressed air to the pneumatic circuit. It allows air to flow into different paths from different sources. It usually consist of a spool inside a cylinder which is mechanically or electrically controlled. The movement of the spool restricts or permits the flow, thus it controls the air flow. It works on the principle that the air moves into the valve and the spring in the valve opposes the force exerted by the air. When this force becomes more than the spring force, the spool moves, letting the required action take place according to the valve chosen. A flow control valve regulates the flow or pressure of air. Control valves normally respond to signals generated by independent devices such as flow meters or temperature gauge. It is the device that actually gives the output i.e. the actuation in the form of a stroke. I pay a visit every day some web sites and websites to read posts, but this webpage provides quality based articles.